The Budget Committee chairman has produced a budget that only makes sense to the conservative base. And that’s fine by him. Reasonable people might ask: What is Paul Ryan thinking? The new budget “plan” from the guy Republicans think of as their “numbers guy” is little more than an assemblage of bumper-sticker slogans. And they aren’t even popular slogans: They’re rehashes of the proposals American voters—including Ryan’s own constituents—rejected in 2012. So what is Paul Ryan up to? Well, if you don’t know by now, you haven’t been paying attention. What Paul Ryan is up to is not balancing budgets or reforming “entitlement” programs. He knows that “the plan” he unveiled on Wednesday—with its $5.7 trillion in spending cuts and fantastical assertion that austerity will balance the budget in a decade—will not be the plan going forward for the United States. A man of Washington with more than a quarter-century of insider experience, he well understands that it may not even be part of the plan. The point, as Ryan watchers will recognize, is to make conservatives believe that Paul Ryan is the one prominent Republican who can see straight when it comes to budget matters. So it is that the House Budget Committee chairman is launching his budget proposal on the Wednesday before the start of the Conservative Political Action Conference, which will bring thousands of the Republican Party’s most determined right-wing advocates to Washington. And who will be kicking things off on Friday morning? In the prime spot to set up coverage of conference? That would be Paul Ryan. Yes, of course, he will have some limelight competition. Sarah Palin is back after going missing for most of 2012. Marco Rubio will drop by for a glass of water. And Rand Paul will deliver a shortened version of his recent filibuster. They’re all pictured on the front of the CPAC promotional materials. But there in the montage, just a little bit more prominent than the other three “stars,” is Paul Ryan. Ryan’s running mate on the 2012 Republican ticket, Mitt Romney, does not get the “star” treatment. Yes, it may be true that Ryan is the rare major-party vice presidential candidate whose image was damaged by taking a place on a national ticket. Yes, it may be true that, once Americans got to know Paul Ryan, the Republican ticket on which he was running began to lose steam. Yes, it may be true that the Romney-Ryan ticket lost Ryan’s home precinct, his hometown, his home county and his home state. But at CPAC, Ryan can still be a winner. The key word is “can.” He’ll need to do some damage control. He is not quite the wunderkind he was a year ago. So Ryan will go “home” again to repurpose himself as the conservative with all the answers—at least for conservatives. That’s important to Paul Ryan. He is a true believer—or, at the very least, a true believer in the importance of getting the true believers on your side. A product of conservative congressional offices and conservative think tanks, Ryan has been attending Conservative Political Action Conferences for more than two decades. And he is, first and foremost, interested in preaching to the base that has always sustained him. So the congressman will show up at CPAC with a budget “plan” that tells conservatives they are still right. Bend, fold and mutilate Medicare into a voucher scheme? Well, of course. Cut taxes for the rich? Oh yeah! But above all, Ryan will, once more and with gusto this time, tell conservatives that they can keep embracing their favorite fantasy: that it is possible to impose austerity, making massive cuts in spending on needed programs, without causing chaos or harm; that the United States can provide billionaires with more tax benefits than they already enjoy, maintain a social safety net, run up military spending to record levels and, somehow, avoid the sort of deficits that Ronald Reagan ran up. The great mass of American voters has seen through the fiscal fantasy. They just rejected Ryanism—by almost 5 million votes in the 2012 presidential race. And that’s enough for Paul Ryan this week. He may still want to be president—although he might have to get in line behind an even more ambitious Wisconsinite, Governor Scott Walker, for that fight. 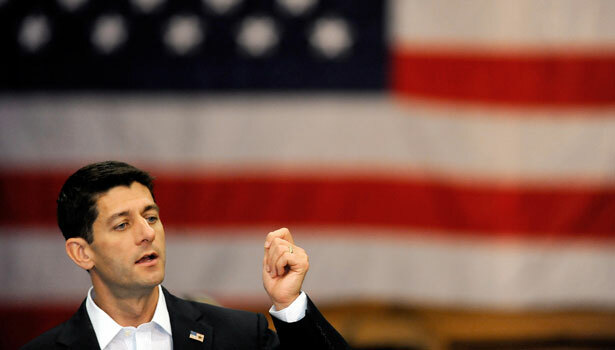 At a minimum, Ryan would like to be considered for speaker of the House. But, above all, Paul Ryan wants to be the king of the conservatives. Because only if he is the king of the conservatives can Paul Ryan imagine becoming anything more. If that means Ryan has to propose a budget “plan” that will only make sense to the crowd at CPAC, so be it. As Republican leaders push for deeper retrenchment, people around the world are hitting the streets to resist austerity. Read Allison Kilkenny’s report.